"The Contributions of AIME/SME to Anthracite Mining and Northeastern Pennsylvania "
The American Institute of Mining Engineers (AIME) was organized in the anthracite region of Pennsylvania by men who were primarily interested in various aspects of the anthracite industry.  Dr. Barbara Arnold, P.E., DM.SME, President of the SME, will be the panel moderator and will talk about the founding of AIME and Penn Anthracite. 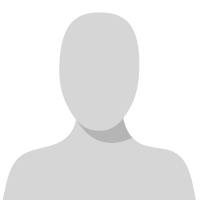 The formation of the Institute was largely influenced, by the necessity for a free exchange of information covering the whole of the mining industry. The object of the formation was to enable members "to meet together at fixed periods for the purpose of reading papers upon and discussing subjects which have for their aim the economical production-of the useful minerals and metals, and the safety and welfare of those employed in these industries." It is probable that this movement, which included the promotion of the "safety and welfare of those employed in these industries," was influenced by the increased complexity of the industry, the influence that this complexity had upon the injury and death rate, and the Avondale Mine Disaster, which occurred two years before the founding.  Dr. Bode Morin, Site Administrator of the Pennsylvania Anthracite Museum will talk about Eckley Coxe. AIME's first meeting, at Wilkes-Barre on May 16, 1871, resulted from a call sent out by three outstanding men of the anthracite industry: Eckley B. Coke, R. P. Rothwell, and Martin Coryell. The best known of these was Eckley B. Coxe, who was the manager of large holdings operated by him and his family, the inventor of a special grate for burning very fine anthracite, and founder of MMI in Freeland. The village of Eckley, Luzerne County, now the Eckley Miners Village, now part of the Pennsylvania Historical and Museum Commission was named for him.  Brian Traweek, P.E., Secretary-Treasurer of Penn Anthracite will talk about the contributions of AIME, SME and Penn-Anthracite and their members to Mine Safety. As the mines had been gradually extended to greater depth, and to seams with more gases, dangers increased and the necessity for adequate means of preventing disaster became more and more apparent. Before the formation of the Institute there had been a number of such incidents, and the Legislature of the Commonwealth of Pennsylvania had only a short time previously (on March 3, 1870) passed an Act known as "Anthracite Mining Laws." The stated purpose of the Laws was: "To provide for the health and safety of persons employed in and about the anthracite coal mines of Pennsylvania and for the protection and preservation of property connected therewith."  John Voigt, a Past Chairman of Penn-Anthracite, will talk about the Scranton-based ICS and Rufus Foster, one of Penn Anthracite's founders. Even with the passage of the "Anthracite Mining Laws," an excessive amount of accidents continued to plague the industry and many, including the AIME insisted that miners be educated in mine safety beyond what they learn from their apprenticeships. Therefore, the Commonwealth of Pennsylvania passed the Mine Safety Act of 1885, requiring miners and inspectors to pass examinations on mine safety. The International Correspondence Schools (ICS) was established in 1891 to fulfill the need of those miners to be able to pass that test.  Jim LaRegina, P.G., will talk about AIME honorary member/Penn-Anthracite member John Markle and the Jeddo Tunnel. Discussions of mine water drainage were and continue to be a major factor in meeting both of the Institute's aims of "the economical production-of the useful minerals and metals, and the safety and welfare of those employed," especially in the Pennsylvania Anthracite industry. In systems of pumping, tremendous changes have occurred during the life of the Institute. In 1871, most of the water flowed to daylight by gravity, through water-level tunnels, though there were a number of pumps. Drainage tunnels continue to constitute an important link in anthracite mine drainage, particularly around the city of Hazleton. John Markle entered the mining industry in the firm his father, George B. Markle, and became known nationally as the builder of the Jeddo drainage tunnel, which reclaimed mines inundated by floods in 1886. The tunnel is 7 ft. by 9 ft. and extends through five miles of solid rock. 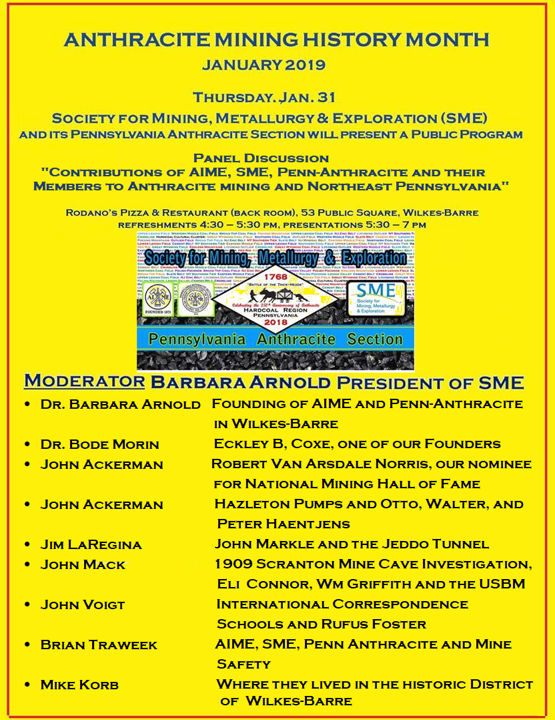  John R. Ackerman P.E., P.G., BCEE, F.NSPE, Chairman of the Penn-Anthracite Section, will talk about Robert V A Norris, who Penn-Anthracite has nominated to the National Mining Hall of Fame; the Barrett, Haentjens Company and Hazleton Pumps, and Otto and Walter Haentjens. Much of today's technology of mine drainage and pumping technology was developed from work of several of the members of AIME and Penn-Anthracite. In addition to the John Markle's Jeddo Tunnel, and the Beaver Meadows-Quakake Tunnel designed by Eckley Coxe, the Drainage Chapter of Peele's Mining Engineering Handbook was edited by Penn-Anthracite's first Chairman, Robert Van Arsdale Norris and an early Penn-Anthracite member, Otto Haentjens, and his son Walter, a Penn-Anthracite Chairman were the inventors of several generations of the famous Hazleton Pumps.  John Mack, P.E., a Past Chairman of Penn-Anthracite, will talk about the early 1900s Scranton Mine Cave Problems/Solutions. For some time, following 1871, the actual mining of anthracite continued in much the same fashion in which it was done when the Institute was formed. When the Institute was founded the systems of mining were not standardized nor controlled through adequate surveying. Pillars in various coal veins were not exactly over or under those of the veins below and above; thus, allowing the pillars of one vein to sink or push through into the chambers of the vein below or above, and allowing surface subsidence to occur. In the early 1900s removal of coal from under Scranton had caused subsidences, "mine caves" and the City and USBM, with the help of the AIME and its leaders, set up a five-man advisory Mine Cave Commission, and hired an Anthracite Engineer and an Anthracite Geologist to find a solution to the MINE CAVE PROBLEM. Two of the Commissioners, John Hays Hammond, and David Brunton were Past President and President of the AIME, and the experts hired, Eli Connor of Scranton and William Griffith of Pittston would become Chairman and Secretary/Treasurer of Penn-Anthracite.  Mike Korb, PE, DM.SME, a past chairman of Penn-Anthracite, will complete the discussion and Anthracite Mining Heritage Month with "Where They Lived" – talking about some of the homes the early leaders of the AIME and Penn-Anthracite lived in, and some of the effects they had on architecture of Northeast Pennsylvania. AIME was founded in Wilkes-Barre, at the Wyoming Valley House on South River Street. Two of the three founders were living in Wilkes-Barre. 22 national mining experts attended the first meeting on May 16, eight of those were from Wilkes-Barre and fifteen additional "Wilkes-Barreans" attended the second and third days of the first meeting. The Penn-Anthracite Section of AIME was also founded in Wilkes Barre, at the Lehigh & Wilkes-Barre Coal Company Office Building (now GUARD Center) which stands on the same property as the Wyoming Valley House did in 1871, and six of its first Executive Committee were residents of Wilkes-Barre. Many of the early leaders of AIME and Pen-Anthracite lived in or adjacent to what is now the River Street Historic District, which is made up of civic, commercial, ecclesiastical, and residential buildings dating from 1860 to 1920. PROGRAM IS FREE TO THE PUBLIC. REFRESHMENTS WILL BE SERVED.